Along with writing, I also speak publicly. A list of some of my past speaking venues is at this link. You can also download my speaking brochure (pdf). Why should Christians concern themselves with the Jewish context of Jesus? We’ll look at some of the many ways that seeing him in his first-century reality can deepen our understanding of his message and challenge how we live today. Jesus’ life was saturated in prayer and he lived among a people of great prayer. We’ll look at some rich Jewish prayer customs that can help us learn to pray more like he did. What did Jesus mean by “Do not judge?” This tough saying of Jesus’ makes a lot more sense in its ancient setting. We’ll look at what the rabbis said that can help us be better followers of Jesus. Jesus had plenty to say about what should come out of our mouths. James too likened our tongues to a tiny spark that can burn down a forest. What wisdom can we learn for how we speak to others? The Bible’s Hebrew words are aromatic and savory from the dusty, ancient land of their origin. Each one is richer and deeper than any English equivalent. 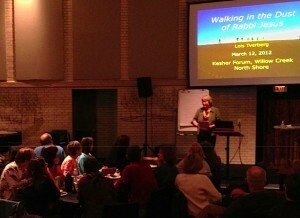 Lois will share some fascinating ways that hearing the Bible’s Hebrew “accent” has helped her unlock God’s Word.